Eddie sat on the ledge overlooking the city of Cavaheim. It was too far away to see any action, but if he was right, Simps already surrounded the city. His knowledge of the Simps was like everything else he knew from this new world. He had no specific memories about them, but when he thought about what Ruby had shown him, he felt the fear of having run in terror from them, as if he'd lost everything to them. Maybe there was a reality where they chased him and bit him and he became one of their mindless horde. The thought gave him the creeps. Eddie wanted to sleep, but worry about Ruby kept him outside, and accusing looks from Kevin caused him to shun the observatory. 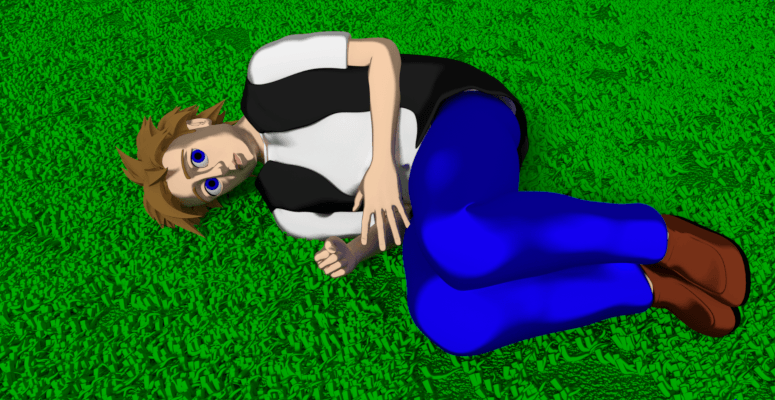 He curled up on the grass and stared at the sky. Eddie's guilt was overwhelming. He wished he could forget everything, like he did when he first appeared in the desert. That had been stressful, but not nearly as stressful as knowing what he'd done. And now Tim was out there, powerful enough to crack the earth, and mentally unstable. How soon before Tim decided to kill everyone in the world. It would only take a whim. Eddie was certain of that. Tim had to be stopped. Not just stopped. He needed to be killed. But how do you kill a god? ...he had to swim to the surface. He was drowning in a shimmering of blue, the waves tugging him back and forth as he ascended. Eddie's head crashed through the surface. He found himself in a blue ocean, the water surprisingly warm. Before him lay the white shore of a tropical island. A thick carpet of green trees blanketed the hills beyond the beach, leading to a low mountain. Eddie's eyes traced up to the peak. Above it, another land mass hovered in the air. It mirrored the shape of the mountain, as if it were a reflection against the sky rather than on the surface of the water. It extended up, then tapered around on the top, forming a floating egg with trees peppering its surface. Eddie treaded water in place, kicking hard to keep his head above the waves, staring with mouth agape at the floating island. "You want to know a secret?" Eddie turned, startled. His rhythm broke, and the next wave crashed into the side of his face. A canine creature stared up at him with intelligent eyes, its chin covered in a shaggy beard, its eyebrows much bigger than any dog Eddie had seen. It looked out of place in the ocean, whatever it was. "What's your secret?" Eddie asked. "He can't see anyone when they're in the impossible places." "You know who. Don't say his name. I don't want him to notice me." "Maybe we should swim ashore." "You don't have that much time. I'm here to give you some advice. You are always hidden to him, but he can find you through the people he knows who know you. He's watching your friends. But no matter who he looks for, his sight does not reach the impossible places—the anomalies." "The anomalies," Eddie repeated. He recalled Tim talking about anomalies when they were in Holcomb—things that can't exist in reality. "There's someone who wants to meet you," the dog said. "She's already told you her name. I won't repeat it." Eddie recalled the dream he'd had while flying up to the observatory. "Gret—"
"Stop," the dog barked. "That's the one. She can't come to you." "She hides from him. It's too dangerous to risk discovery. But you can find her up there. The dog pointed up at the egg-shaped island above the mountain." "I won't tell you, but if you take the duck, you'll find it." "Take the duck," Eddie repeated. "What is that supposed to mean." "Ask the big fat guy. He knows. Take the duck, and you'll find the one who knows." 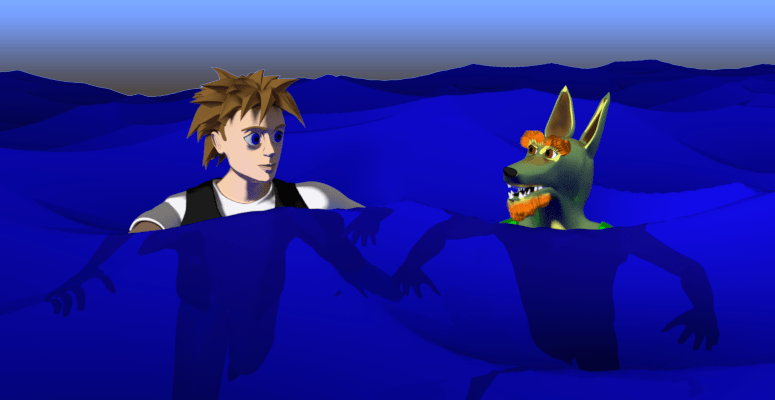 The dog offered Eddie a canine grin and sank down into the water. Eddie watched the creature fade into the deep, bubbles leaking up from his mouth as he descended into darkness. Eddie wasn't sure what to do next. He swam towards the shore for a few seconds when a huge wave the size of a building crashed down on top of him. Eddie sat up with a jerk. He was still on the grass, still on the pinnacle high above the world. Just a dream, Eddie told himself, but he didn't believe it. He didn't have dreams anymore. There was too much crammed in his mind for ideas to have space to mingle and come out at random. It all meant something. But how could there possibly be any rational explanation for the order to Take the Duck? What in the hell was that supposed to mean? Gretchen Atwater . That was the name that had come to Eddie in a dream earlier in the day. What was so significant about this person, and why couldn't she come to Eddie? And why was the dog afraid to say her name? Could Tim hear Eddie's dreams? Eddie staggered up and returned to the observatory. Inside, Basha remained asleep on the couch. Kevin was on the platform under the telescope working at his laptop. He scowled down at Eddie. Eddie hesitated. Kevin probably hated Eddie more than anyone. How could Eddie ask him for help? Cautiously, he climbed the stairs. "What do you want?" Kevin muttered. "Sure. What'll it be? Poison babies? Burn down an orphanage? Or do you want to try collapsing the universe again?" Eddie got angry. "I didn't mean to hurt anyone." "You didn't mean anything. You didn't think." "Yeah, well were you thinking when you went to bed with a sixteen-year-old? What are you? Thirty-five?" Kevin's eyes widened. "She's eighteen." "Is that what she told you?" "It was..." Kevin stammered. "She was... look, you weren't here." "And you weren't at Tim's. I still don't remember most of what happened, and you're comparing me to Adolf Hitler." "No, you're more like Adolf Eichmann. You saw the signs that something wasn't right, and you went ahead and walked through that time portal anyway. Just an average guy going with the flow. I bet it was fun." Eddie frowned. "You want me to leave?" "As soon as your ride comes back. Unless you feel like jumping." "I'll go sooner if you can help me with something." "Twice now, someone has told me that I should.... uh... take a duck." Eddie sighed. "It's a little weird." "Take a duck? Terrorizing duck ponds is a step down for you, don't you think?" Kevin turned back to his laptop and clacked away at his keyboard. Eddie turned and descended the stairway. He was at the bottom when Kevin said, "This is probably the duck you're referring to." Eddie spun. 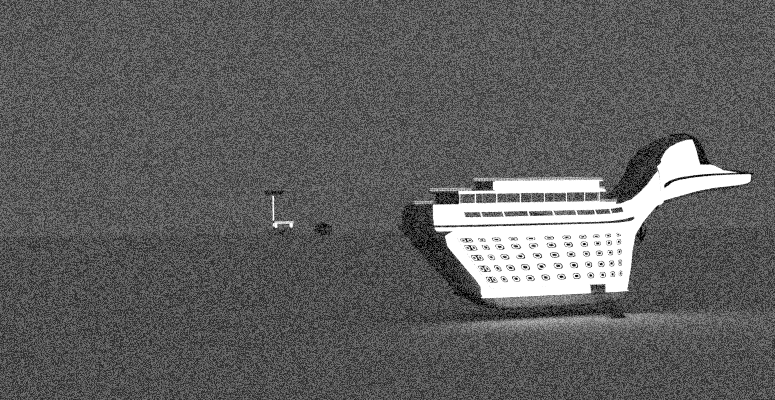 On the large screen behind Kevin's desk, a grainy black-and-white video depicted something that resembled an ocean liner, hovering above a barren landscape. The front of the monstrous vehicle drew up into a tapered section that resembled a head with a duck's bill protruding forward. Eddie approached, stunned. "Where is this?" "No idea. There's a camera out in the middle of nowhere somewhere that doesn't show much, but this huge duck-like-thing appears in the video every ten days, down to the minute. It stops for two minutes, then hovers away." Eddie stared at it. Could that be what his dream referred to? How could it be anything else? "And you don't know where this is?" A gangplank hung down from the duck. Eddie watched as the walkway withdrew into the body and the duck hovered away out of camera view, leaving behind the empty desert scene. One tiny landmark remained in the distance, a few pixels high. "Wherever it is, the duck will be there again tomorrow afternoon at 4:37." "What's that in the background." "Could you enhance that part of the picture?" Kevin scoffed. "Not from the archive, but I could switch to the live feed and try to zoom." Kevin hit a few keys, and the image shifted. It was the same scene, but the light had changed, the shadows on the crags in the earth shifted slightly. In the distance, the same tiny structure blemished the flat horizon. "I'm not sure what this camera can do," Kevin said. He held a key down, and the camera zoomed back. He held another, and it zoomed in. He tapped around, adjusting the camera angle. "That's the best I can do. I doubt this will help you." Eddie stared at the screen. "Actually, I know exactly where that is." On the screen was a low, squat structure, an open canopy over gas pumps and a rotating sign presenting the gas station's name. Fuel Fast.